It's only begrudgingly that my compilation of the best Advent calendars includes any that aren't filled with chocolates. Because forget crap plastic toys and dumb erasers straight out of the gum ball machine! For me, the only thing that I can look forward to as much as Christmas itself is a daily nubbin of super special chocolate over the month leading up to it. In fact, as an adult, I look forward to my Advent calendar edibles even more than Christmas morning. I mean, between what I spend for gifts and what I get these days, I usually end up finishing off the holidays in the red. Huh. Spend green to go red. I finally understand why those are the colors of Christmas. Anyway, here are my picks for the best Advent calendars of 2018. Hot Wheels gets one of my non-chocolate passes in this Advent calendar collection. Maybe you have a kid who can't eat chocolate, or too much sugar. Maybe - gasp! - you have a kid who doesn't like sweets. Or maybe your "kid" is a 35-year-old-man who also goes by son / husband / brother / cousin, and he's trying not to pile on any more calories than the endless holiday dishes, desserts, and booze at parties and family get-togethers are already going to send straight to his belly. For all of these people, Hot Wheels are not a bad second choice. The calendar has a fold-down lid that doubles as a car track. Inside you'll find windows containing 16 Hot Wheels accessories and 8 full-size decorated Hot Wheels vehicles. You're gonna pay for it, but there's no arguing that LEGO includes a good chunk of Star Wars swag in their Advent calendar from a galaxy far, far away. Specifically, you'll get vehicles The Ghost, The Phantom, Stormtrooper transport, Rey's speeder, Millennium Falcon, Snow speeder, Kylo Ren's Command Shuttle, Y-wing, TIE Striker, Hover tank, and AT-ST. Doors also contain 7 minifigs, including a holiday-themed special. The calendar comes with a foldout playmat with Jakku, star killer base, and deep space play scenes. Nestle has built a spin on the traditional Advent calendar that doesn't stray too far off the cherished path with their Big Ben clock tower design filled 7 different varieties of peppermint chocolate true to the After Eight line of chocolate-covered gooey fresh breathness. The After Eight Big Ben Advent Calendar also has a more mature look and chocolate theme, so the adults out there can take pleasure in the Christmas countdown without feeling sheepish. And without settling for the cheap, fake-tasting chocolate brands marketing their calendars to those with less discerning palates might choose. My last non-chocolate entry on the best Advent calendar list does still contain candy. And if I'd gotten a Haribo gummy version of my pre-Christmas cardboard doors as a kid, I wouldn't have complained. Coming direct from Germany, the Haribo calendar contains a mixture of fruit and cola-flavored gummies, marshmallows, licorice, and gums. Germans really love their: 1) chocolate; and 2) Advent calendars. This one from Lindt is also made in Germany, and - spirit of Christmas giving bonus! - it has 31 novelty chocolates inside. Shapes include Santa, a snowman, a seal, and icicle, a penguin, and angel, and a star. Chocolate flavors are milk, white, and hazelnut. Another decidedly adult-themed entry, Lindt's Dark Advent Calendar isn't for those celebrating the Devil or Darth Vader this holiday season, it's for people who like their chocolate of the non-milky persuasion. The 24 doors cut out of the calendar's winter scene hold Lindt Noble Bitters and Fine Hearts Chocolate with different fillings and Pralines. 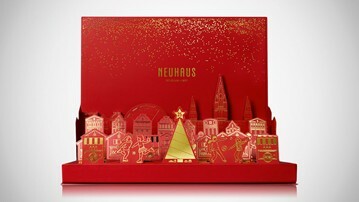 I just ordered Neuhaus' fancy pants take on the Advent calendar for mys- ... uh, my wife, She-Ra: Princess of Power. It hasn't arrived yet, but at $70 it sure as Santa better be an Advent calendar to write the Baby Jesus about. At least on the outside the calendar's Winter Wonderland pop-up scene is pretty alright. And they say behind those 3D doors lie 25 full-sized Belgian pralines. The combined effect is intended to take you right back to (or right to for the first time for the most of us who have never been before) the Brussels Holiday Markets. Drinks by the Dram's mini-booze-bottle-filled Advent calendars are a superfun awesome way for adults to partake in a beloved childhood tradition. Because all superfun awesome childhood traditions get even better with booze. Calendars count down the traditional 24 days leading up to Christmas, with each door rewarding its perforated-cardboard-puncher with a different sample of whisky, scotch, gin, or vodka, depending on which you prefer as your merry maker.